As everyone knows by now , Shrimp /Prawns are my fav seafood. I would immediately try any new recipes that falls in my way.. The same thing happened when Suja of KItchen Corner had posted her ginger chicken recipe.. I couldn't help myself from trying this delicious ginger fry.. It was ,.. ahaaa ohoooo.. Simply outstanding.. My friend Savi also tried after my attempt and said the same... Thanks Suja for having introduced this fry..
Clean the shrimp and marinate with GG paste, turmeric and red chilli powder , meat masla powder, lime juice, salt for minimum 30 mts. Heat the oil in a kadai and fry the chopped onions ,curry leaves ,fennel seed powder over medium flame, take care not to burn it.. Now add the chopped ginger and saute well in the oil for 2 minutes in medium low flame. It's time to add our marinated shrimp.Dump the marinated shrimp into the kadai and combine well to blend . Add the coriander powder and mix well. Cover and continue to cook for 4 minutes till the shrimp gets cooked in medium low flame. Finally add the mint leaves and mix well .. This gives a nice minty flavour to the dish in the end .. Switch off the heat and serve..
Mouthwatering recipe dear...nice pic too..
Yours looks so inviting dear,beautiful and tempting clicks..
shrimp is even my fav when it comes to seafood!....looks tempting! Slurping and drooling dish. Looks amazing. Slurp,mouthwatering here, fabulous looking ginger shrimps..
mouth watering.even i have tried it.will post it soon. 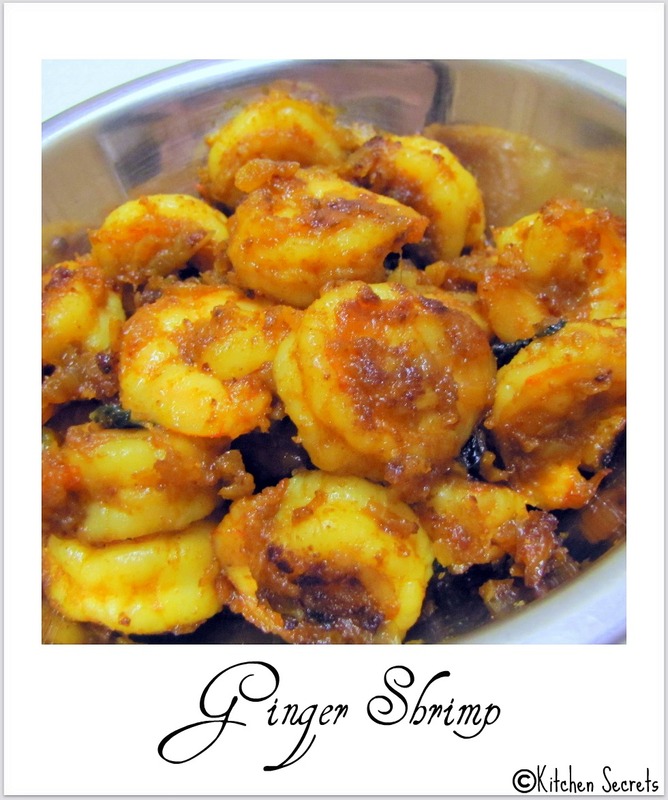 wow, i love ginger chicken, but not a big fan of shrimp, shall try same with chicken Shanavi, looks very inviting..
these shrimps look absolutely tempting !delicious ! Has come out so mouthwatering and perfect!